I love any cat themed items and have in the past had other cat themed wishlists that can be found here, as well as cat nails which you can find here and here. 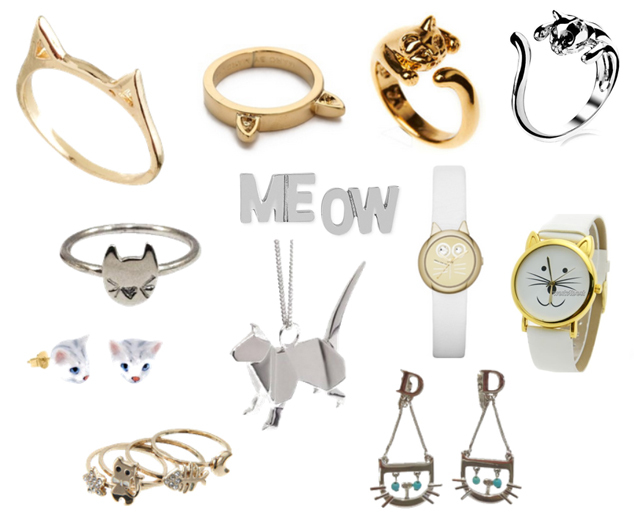 This wishlist is purely based around cat jewelry and accessories. I found some items that are lovely but really expensive so I have included some cheaper dupes that can also be found online. The Zara Taylor Jewellery Cat Ring Gold is really cute and isn’t that expensive but if you are looking for a cheaper option then on eBay you can find Black Crystal Eyes Cat Ring which is a much cheaper alternative. This can also be said for the Marc by Marc Jacobs Ladies Critters Watch on my cat jewelry wishlist. It is a bit pricey, especially for a more statement that everyday wear watch. I found this Cute Cat Face Watch again on eBay and it is so cheap. I have bought watches in the past from eBay and been pleasantly surprised with the quality. The last item on my cat jewelry wishlist I found a dupe of was for the Marc by Marc Jacobs Cat Ears Ring.It is so simple and sweet but there is a very similar and much cheaper ASOS Cat Ears Ring. My favourite item is the Origami Jewellery Necklace Cat. It is such a cool design, so unique and different to anything else I have seen and is good quality, made from sterling silver. My favourite cat jewelry item is the Origami Jewellery Necklace Cat, which is yours?